You've probably noticed LED bulbs situated next to the incandescent and compact fluorescent (CFL) bulbs at your local hardware store. I spend way too much time in these aisles. This is capitalism at its finest! I find the battle of new tech, smart manufacturing, and massive demand intriguing. I've switched almost all of the lights in our house over to LED in part because of the (small) energy savings, but mostly because I'm lazy: A 22-year lifetime means I don't have to climb a ladder for a while. When I purchased my LED bulbs a few years ago they were around $15 a pop. As with most all tech, I've watch the price drop over time. In this case, LED bulbs in my local Home Depot (Philips 60W) are hovering around $10. 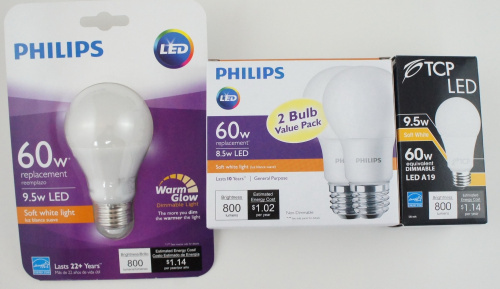 On a recent visit to the lighting aisle I was taken off guard when a pack of two 60W bulbs by Philips were selling for $5 ($2.50 each!). This is not just a drop in price, this is an all out price war between some heavy hitters. Confusing me was the fact that right next to these 60W bulbs for $2.50 were 60W bulbs for $10 from the same manufacturer. Upon closer inspection I noticed something odd. These lower cost LEDs had a display life of 10 years as opposed to 22. Ok, so they shaved some cost by shortening the life span of the bulb. Neat marketing trick but the engineer in me wanted to know how. Nothing too crazy. 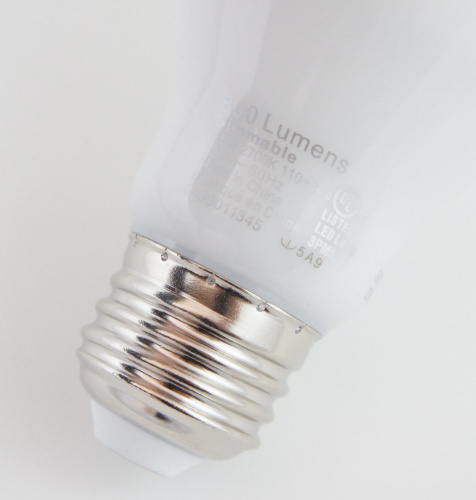 Each bulb claimed to be 800 lumen at various power consumption levels (8.5W to 9.5W). And I only noticed this now but the cheap bulbs are non-dimmable. Interesting. Hard to see in the above image but the bulb in the center (cheap Philips) is slightly shorter than the more expensive Philips bulb. 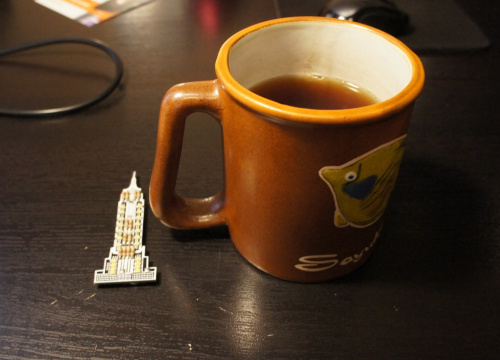 The TCP is about a centimeter taller. This has little effect on lighting but millimeters of materials will begin to matter. I did a quick initial test to see how the bulbs performed. They all have seemingly identical brightness and warmness so I'm going to trust the advertised 800 [lumen](https://en.wikipedia.org/wiki/Lumen_(unit) rating. Hard to photograph, but the first bulb we'll be dissecting is the $10 Philips 9.5W bulb that consumes 110mA at 120V. I'm not sure how they get to a 9.5W advertised burn (120V * 0.11A = 13.2W). Perhaps the actual LEDs consume 9.5W and the ballast (the thing converting AC to DC) consumes the rest. This would be a super-sneaky marketing ploy, as I assumed the rating on the outside of the packaging was the overall power consumption of the bulb. All three bulbs had opaque plastic upper bodies. 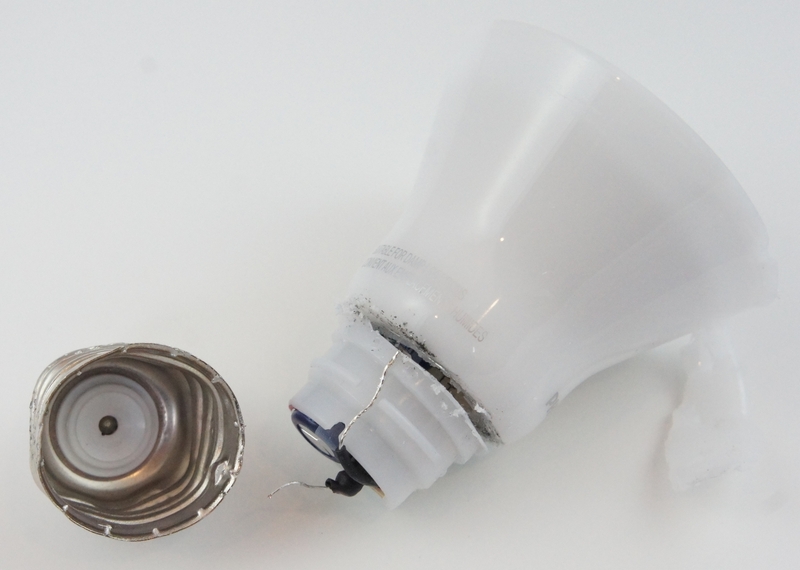 The expensive Philips bulb came apart with some strong twisting. Underneath was a neat plastic diffuser. Under the diffuser was a mixture of small and large LEDs. 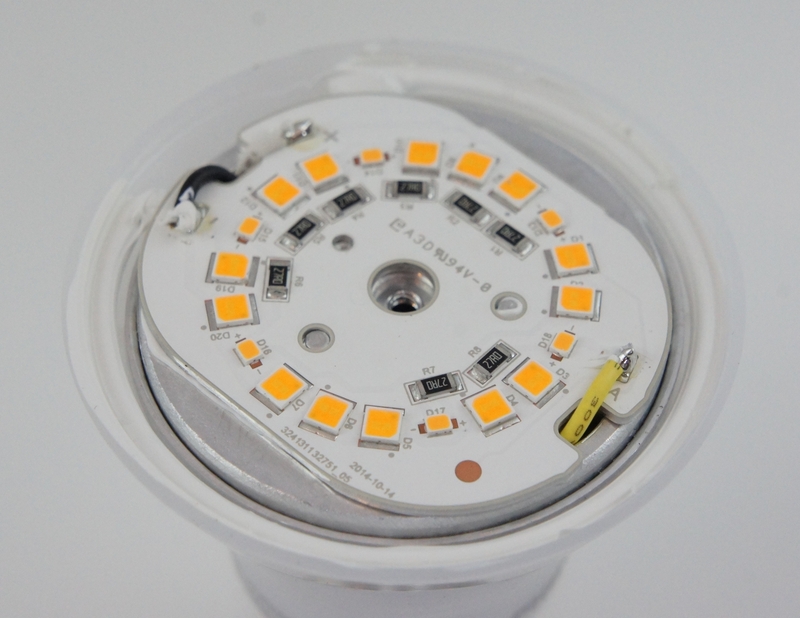 Not what I would have expected – 14 big LEDs, 6 small. Note the three wire connections labeled +/-/A, as well as the date code: 2014-10-14, a delta of 7 months from when I purchased the bulb. The date is probably in relation to design version and not manufacture date. With quite a bit of prying force, the metal LED PCB comes off the metal base heatsink. This was to be expected; there was good thermal grease sandwiched between the PCB and the heatsink. I originally tried to desolder the wires connecting the PCB to the ballast but quickly gave up as my solder iron was not hefty enough (nor was I patient enough) to bring that large chunk of metal up to soldering temperature. Some further prying and we can see the ballast underneath. I got a bit forceful with a hacksaw so ignore the hack marks for the moment. The metal base is threaded onto the plastic base and then spot crimped to the plastic (you can see the multiple dots or dimples around the metal base). This is the first clue that Philips is working on simplifying the manufacturing process. Furthermore, the two exposed wires in the picture are not soldered to the base, they are compressed to it, additionally simplifying the assembly process. The ballast! Lots of caps, an inline fuse, transformer, inductor, and a few transistors. C1, C2 and C3 are metalized polyester film capacitors. Q1 is a 13005ED (datasheet) fast-switching NPN power transistor). The transistor on the far side of the transformer is a D4251T (datasheet) high voltage, fast switching NPN power transistor. The big cap is a 330uF/50V/105C. Inductor is 3mH. Here is the rear side of the ballast. A smattering of passives plus an ABS10 (datasheet) bridge rectifier. Next up is the $2.50 Philips bulb. 800 lumens, 8.5W, 138mA at 120VAC. The bulb base also has the words 'Caution: Do not use with dimmers'. Removal of the two screws and some forceful prying removes the metal PCB from the heatsink. 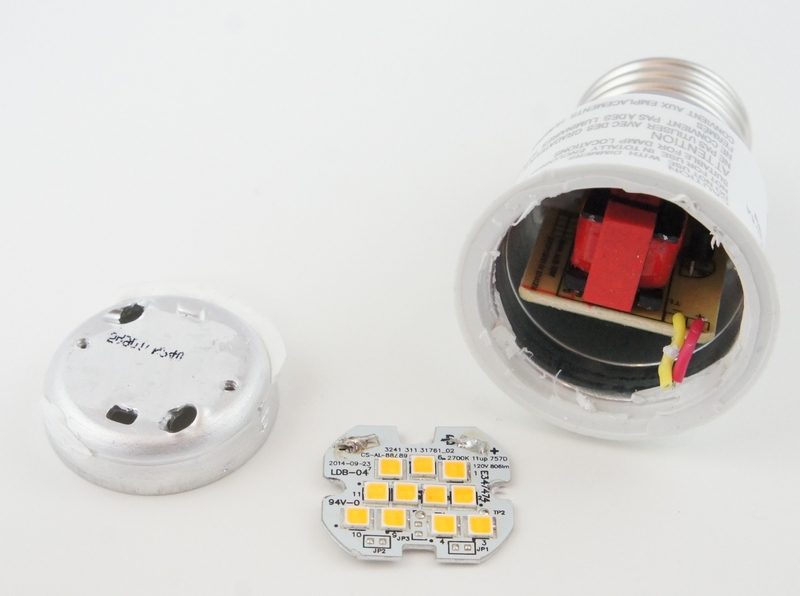 The PCB is thinner and the overall metal content is much less than the larger, more expensive bulb. Perhaps this is the reason for the shorter life, and possibly a factor in the reduction of cost (less metal = less $). Just like the last Philips bulb the two AC wires are connected via pressure against a twist on base. The ballast slides out easily once the base is off, and we can see it's much more simplified than its more expensive brother. It still uses a fuse (thanks Philips!). Q1 is a 13003 NPN power transistor. The inductor is 3mH. Big cap is 8.2uF/50V/105C. Another collection of discrete components. The same ABS10 (datasheet) bridge rectifier. I am somewhat surprised to see they silkscreened the back side of the PCB. I would have guessed they would save a few cents and not put component labels on the board. Perhaps there are just enough polarized components that they wanted to avoid the possibility of error. Finally we have the bulb from TCP. I have never heard of this brand but wanted to see how the design for manufacture might compare to that of Philips. This beast is much harder to open. The base of the bulb came off before I could hammer the top off with a screw driver. Same technique: the AC wire connection to the ballast are press fit under the base. After much fighting and dirty words, the lid was removed. This bulb uses an interesting metal diffuser. Underneath are 14 large LEDs. 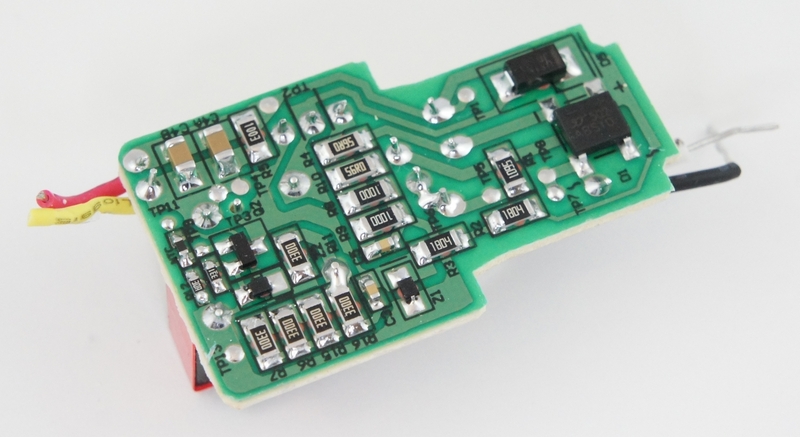 Note the power connection to the PCB comes in via an SMD connector from the bottom. I thought this was a great way to simplify the connection between ballast and LED boards. The TCP bulb was a beast to take apart. Here are the bits. 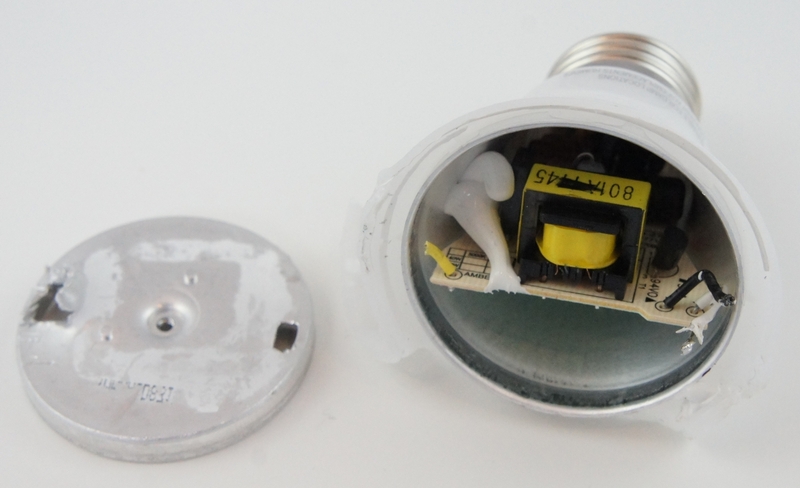 Of note, this bulb uses one solid piece of metal rather than two and uses an additional plastic insert not found in the other bulbs. The ballast in the TCP is similar but slightly more complex than the other two. There are more caps and an additional, small transformer. The two transistors are 122DL NPN (datasheet). 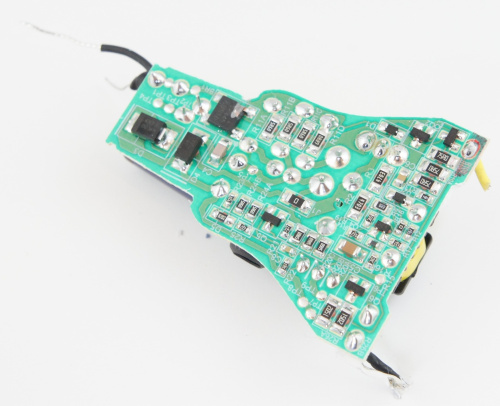 The backside is more sparse than the other two ballasts, but contains similar parts. 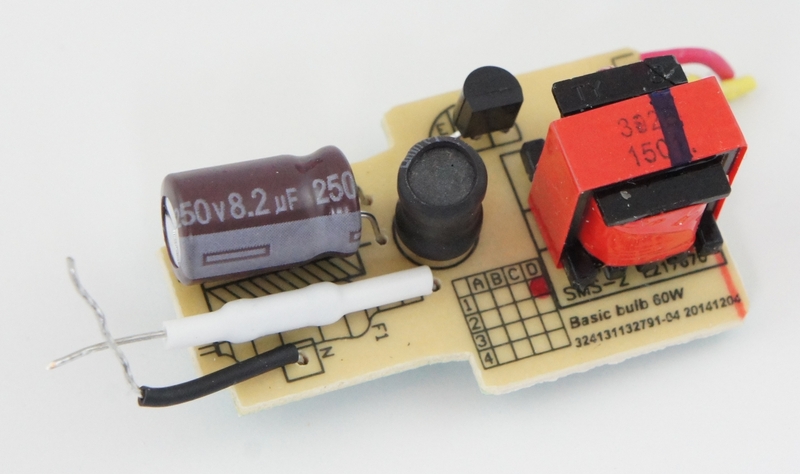 The bridge rectifier is the MMB6U (no datasheet found). Many more tantalum caps diodes. More metal does not necessarily mean longer life but we see where the $2.50 bulb is shaving costs. That's a total BOM cost of around $2.58. I am obviously taking big swags at the cost of components, especially in the volumes Philips must be dealing with (hundreds of millions to billions sold each year). My point here is that no matter how much you buy of something it's never zero. I assume Home Depot is getting 20% margin (this is very thin, most retail is 50% or more). This is a fool's errand obviously, but I just can't make the part costs sane and have Philips come out in the black. In the end I am dumbfounded by the market drivers of competition and scale. The lowering of the cost of materials, manufacturing, and marketing seems to have pushed the race to the bottom even harder. For $2.50 I am willing to forgo dimming and accept the decade-shorter life span. Gone are the days when you could string a coil of wire inside a vacuum and use it to light up (and heat) a room. I've got a bulb left over from the $5 2-pack. I'm not sure if the bulb will still be lit (I'll check back in if it burns out) but I'm excited to see where lighting technology is headed in the coming years. Do us a favor, before you destroy bulbs that have switching power supplies, check them for RF interference. Place a radio tuned to a medium strength station a few feet from the socket and see if it affects reception. Not scientific, but you can compare different bulbs. Good idea. I'll try that out next time. 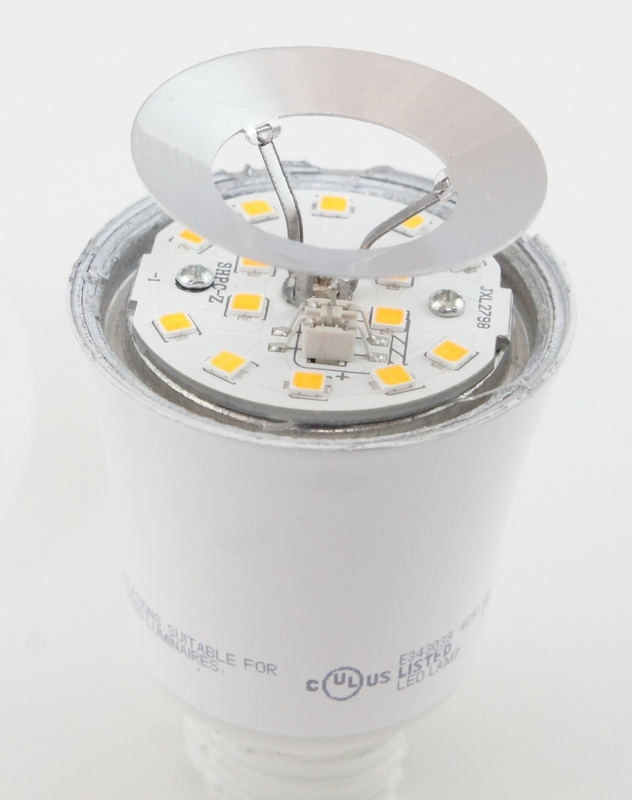 Would you expect the RF interference to be the same for CFLs and LEDs, and for general florescent lighting as they use similar ballast technologies? Good question. Do you get more RFI from a switcher with a high voltage output or from one with low voltage output? Does Sparkfun have some kind of spectrum analyzer? Some of the products require part 15 testing? I have a floor lamp next to my man nest rocking chair here. The CFL I put in there pretty much killed the FM radio plugged into the same outlet. I put a .002 ufd across the lamp socket and that took most of it out. Ya, I have a two meter FM rig in my garage about three feet from several LED bulbs. They make the radio almost useless. Second is that there were reports a couple of years ago in the ham (amateur) radio world that some brands of LED lights put out huge amounts of RF interference. I haven't gotten around to testing this myself, but folks should be aware that there is a potential problem. Lastly, building those ballasts in the U.S. would involve several times more in labor alone than the total cost of the bulbs. I think you have the information about a capacitive load backwards. If your power factor isn't 1 then it still costs the power company something to light your bulb, but it is hard to measure and bill what you are using. Yes, that's what I was talking about. If you look up at the power poles, you'll see cylindrical things a couple of things in diameter and maybe 3 or four feet long. These are transformers, often referred to as "pole pigs" (partly because they look like a pig, and partly because they have a bunch of "pig" iron in them). Sometimes you'll see sets of rectangular boxes -- these are often capacitors installed by the utility to try to get the power factor closer to 1, making up for all of the electric motors in A/C units, fridges, vacuum cleaners, ad nauseum. Can't resist: "hacker uses hacksaw making hack marks." 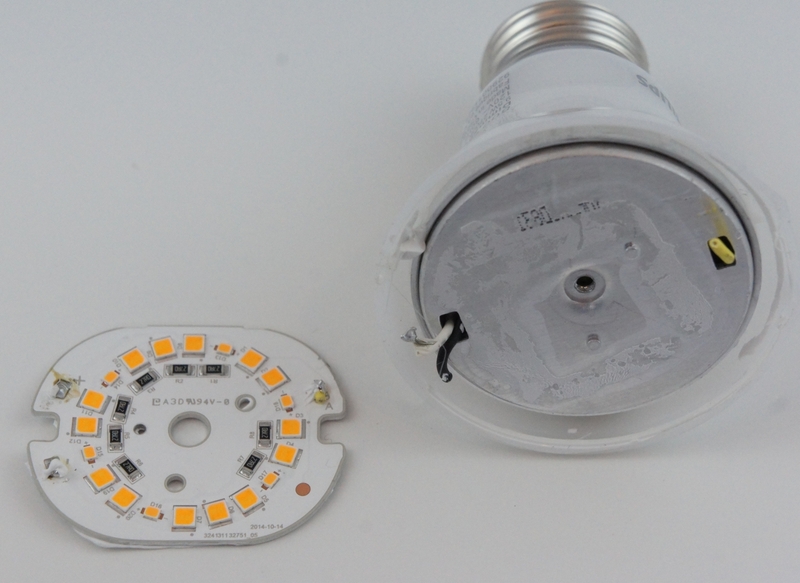 Very timely post - I brought a Ikea led bulb to work today to dissect it. Early cfl bulbs were notorious for either failing very fast and/or burning up, complete with flames. Poor design switcher circuits with low efficiency made 'em run hot. Also, a major factor was mounting them base-upwards such that the switching ballast ran hotter. I expect the newer led bulbs will go through the same evolution but probably faster since the producers have probably learned from past mistakes. 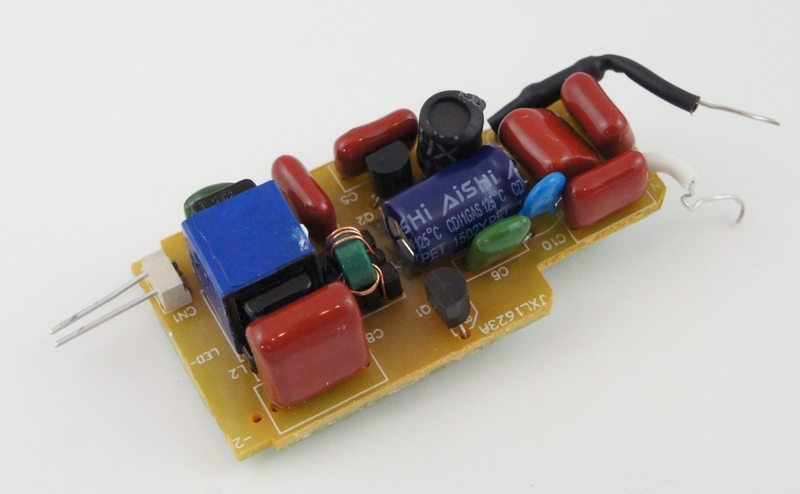 Cheap switchers often rely on full voltage sine wave power so triac based dimmers can make them either fail or run hot. If someone wants to do some lifetime comparisons, it would be good to note which way the bulbs are mounted or to do two of each - one 'up', one 'down'. Thank you for pointing out the issue with the triac dimmers. That explains why I have been having trouble with CFL bulbs in several rooms in my house. 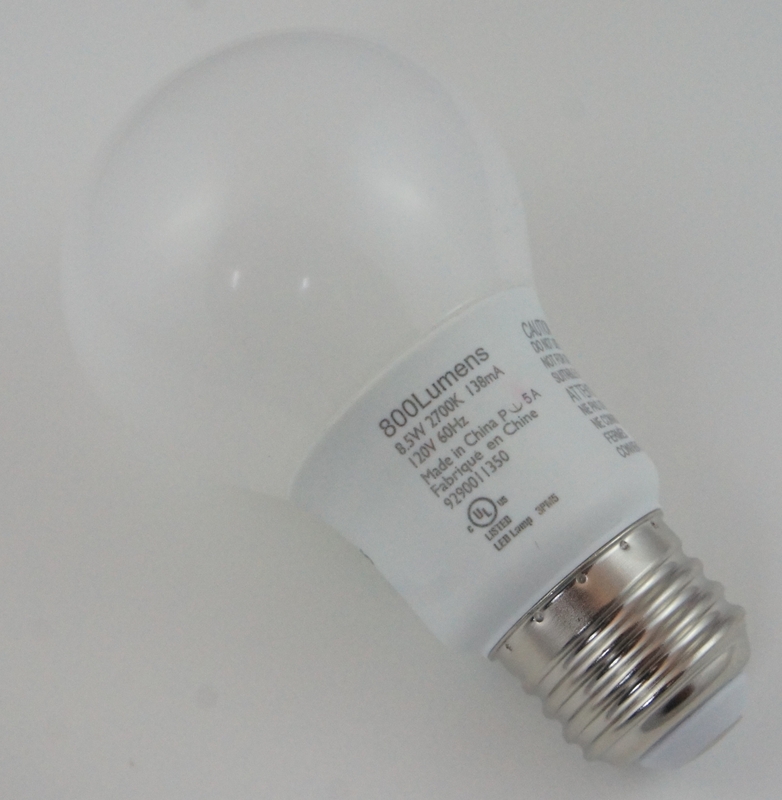 I have had 5 LED bulbs fail: 1) A Home Depot "ecosmart" brand 40W bulb made by Lighting Science that was later recalled. It simply quit working. The recall said that it might catch fire, so I guess I was lucky. 2) A Cree 100Watt ($20!) bulb from HD that is not rated for use in an enclosed fixture, but I had installed it in one anyway. Quit working completely, slight burnt smell. 3) Two Cree 60 Watt bulbs from HD that are allowed in enclosed fixtures, and were installed in enclosed fixtures. These started flickering horribly. When I took them out of the fixture, they had a nice "burnt" smell. I'm torn as to whether I should disassemble, as they should be replaced under warranty if I refrain from taking them apart. 4) Another Cree 60 Watt bulb from HD, not in an enclosed fixture, flickering more than is tolerable, no burnt smell. HD exchanged this one. I've always had trouble with lights burning out early, whether they be incandescent, CFL, or now LED. My line voltage is at the high end of the allowed range: 124-125V. It's reasonable that this would shorten the life of incandescent bulbs rated at 120V, but it shouldn't affect CFL's or LED's with switching power supplies. Designing a bulb that needs to be "base downwards" is just plain (a) piss-poor engineering and (b) piss-poor marketing. The vast majority of sockets are more-or-less "base upwards". Walking down the lighting aisle at the hardware store of the same brand Nate used would confirm this. 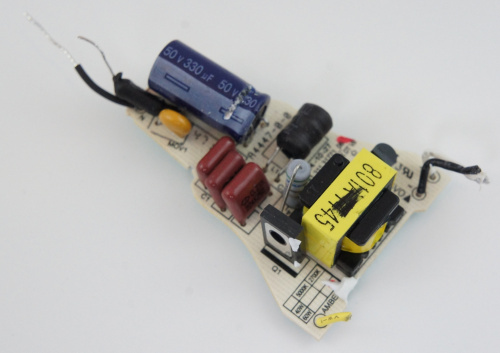 BTW, the cheap switcher ballasts ("non-dimmable") can also destroy the triac based dimmers. Also, I bet that their per-bulb costs on a lot of the items above are much lower than your guesstimates for the volumes they deal in. Especially for the shipping and metal bits, but also I bet of lot of the components are sub 0.01/unit. If that sort of thing has your interest, I'd say hit up YouTube. There's quite a few channels on there that do almost nothing but tear downs of LED lights and other cheap electronics. bigclivedotcom, Julian Ilett, electronupdate, etc. Bigclive especially tends to go over the boards, draws up a quick schematic, etc. At this point, though, all of them tend to be very much the same with only minor changes in passive or the odd change to a new driver IC. This is very interesting and great work! I just opened an IKEA VÃ¤xer 10W for plant growth. 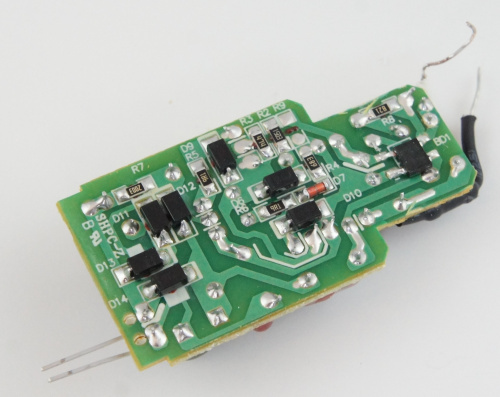 The LED board drew 160 mA and the voltage for it from the current source is 62V DC. The 8 white LEDs have 6.5V * 160 mA = 1040 mW each and the 5 red LEDs do 2.1V * 0.16A = 336 mW each. They are all in series an no visible serial resistor on the board. I infer from this the the white LEDs would have a serial resistor on board and and the red not? Even with 3.25V on the internal white LED the wattage just wasted would be 3.25V * 160 mA * 8 = 4160 mW. What' wrong with my reasoning here? From https://en.wikipedia.org/wiki/Light-emitting_diode#Colors_and_materials I find no junction with more than 4.2V forward drop. 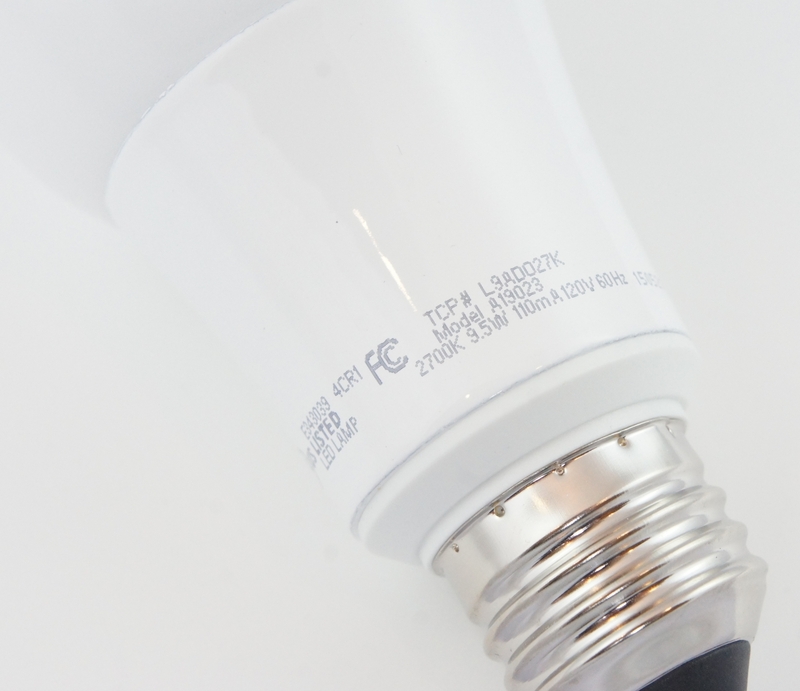 The bulb by TCP is the same company who makes Great Value products for Wal-Mart. Here's a lowdown on the power use of some of the bulbs. Thought I had a couple more laying around but I must have put them in my sister's and mother's house. PF is power factor, looks like the CFL and the Philips cheapo are the worst at this. My meter doesn't say whether it's inductive or reactive, so take your guess. Also a note, the Cree bulb and the Philips SlimStyle listed above are a couple I could use in my garage door opener. Some others would allow me to open the door, but I had to wait for the light to shut off to close. So to much RF noise with the others I had. 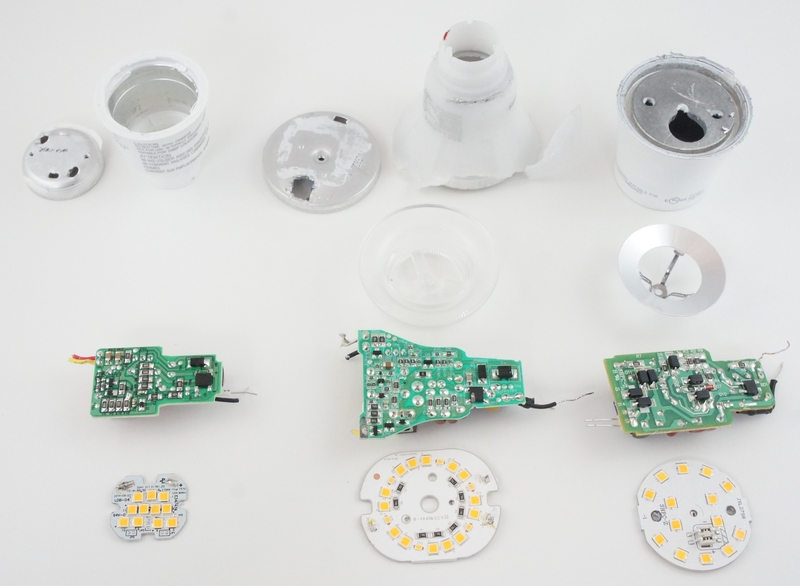 I did a teardown of a couple of the cheap Cree bulbs when they first came out. https://flic.kr/p/egvUYK this is the 40W equivalent version. I don't have a picture of the 60 watt equivalent but it just added a second row of LEDs (2x the LEDs), the remainder of the thermal solution was the same! By spreading the increased power over more LEDs (i.e. 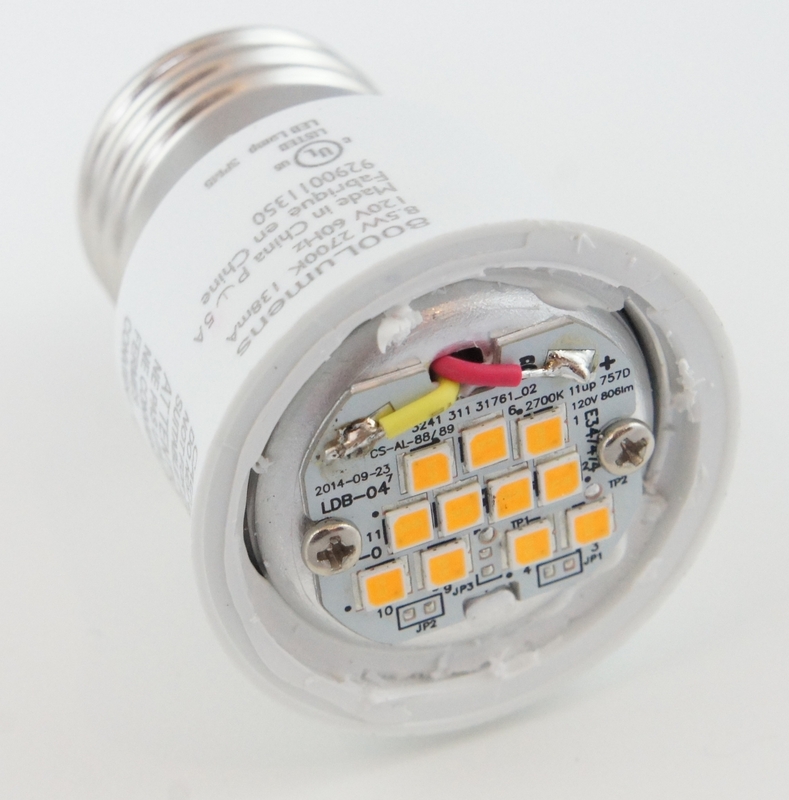 each LED is driven at lower power) they can still keep the Junction temperature down despite a hotter case. 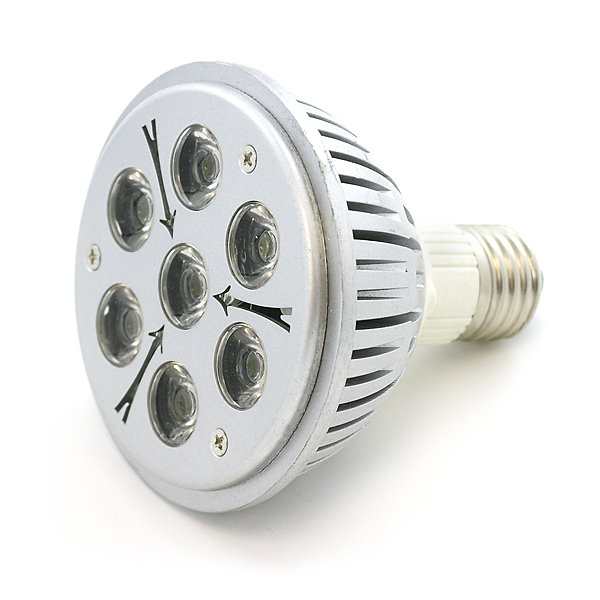 That model used the Cree XT-E HV (24V model in the 40W and 12V model in the 60W) all hooked in series. The power supplies actually boost the voltage (as all the LEDs are hooked in series)! The only difference in the supplies was a couple component values (inductor and some resistors). This is right on target. The weak link is the electrolytics, and heat kills them. Also, your wag on component costs is off by a factor of 10, more or less. Nothing in there costs more than a few pennies at the quantities they are buying. The manufacturing cost is referred to as "Direct Material/Direct Labor" or DMDL; if they can't get DMDL below 20% of the sale price, they won't bother selling. That includes shipping to the retail store's distribution center. Factor in utility subsidies for a buck or two. "How do we do it??? VOLUME!!" I happen to be in Connecticut at the moment (I live in AZ), but we went into the local hardware store of the same chain where apparently Nate went (those price takes are sure distinctive!). They didn't have the 2-packs of Philips, but they DID have a 3-pack of Phillips 60w-equivalent dimmables for $7.97, though they're the "sort of flat loop" style (didn't notice that until just now). They'll do for what I have in mind for them. They also have Cree 60w "ventilated" bulbs, the "soft whites" for $2.97 each and the "daylight" for $3.97, and the sign said that they were being subsidized by the local watt-pusher to the tune of $5.00 each (i.e., they're regularly $7.97 and $8.97). I found LED lightbulbs at Walmart for 88 cents last night here in Maine. I would love to see your review of a Cree branded lightbulb. I have been very happy with their performance and light distribution. Very nice. In Western Washington the $2.50 one is not in the stores. In fact, the twin pack for under $10 is 40W. For $2.50 I would have bought a bunch. I have a case of HP blade PSU's that are nice and efficient and output 12V at 75A (100 amps with 220V input). I was thinking about tearing the lights apart and making a rail to light a long work bench. An old jumper cable is about the right gauge I think. The only drawback is that if you load these PSU's high enough to get efficient, the tiny cooling fan screams like a banshee. More important, the more expensive longer lived units may produce a significant cost savings from reduction in the amount labor and work/home injuries from cutting bulb changes in half. Last time I taught high school math, there was a section on linear programming (basic algebra/pre-algebra). If people actually learned this stuff, every high school grad could draw a linear programming graph and find the optimum. Really good point. They did cut down on the packaging. When replacing incandescent lamps, remember that while LED and CFL provide cheaper lighting, they also don't heat your house as much, so your heating and cooling costs may change. 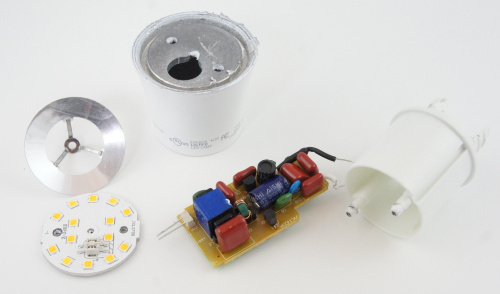 Incandescent lamps can be safely thrown out with regular garbage, but CFL (and maybe LED?) 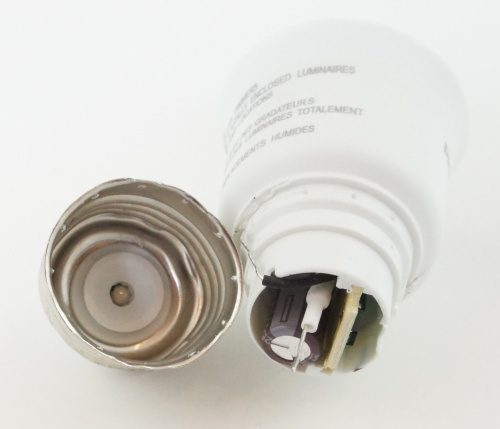 bulbs cannot, as they contain nasty stuff. Dispose of them as hazardous waste. Conservation isn't just about reducing energy use. There are also finite natural resources to consider. LEDs in particular contain rare earth elements, and some people are worried that increased LED use may deplete them. I never got onto the CFL band-wagon because of the mercury vapor that is in the tube, just like every other fluorescent light. To be properly disposed of one would need to send them through a mercury reclamation process, not something that joe public knows about. The LED bulbs (unless they use some custom and toxic cooling fluid) are no worse than any other electronics. Dispose of them with all your other e-waste that you already know how to deal with. My hat is in the LED bulb camp, I have several Cree bulbs in my home already. The two pack of bulbs is a 90 Day deal as an initial release, so buy them now. I assume that after the first 90 day deal has expired the bulbs will most likely increase to $5 each (just a guess). It seems like Philips is pushing the cheap 2-pack to possibly buy back some of the market that Cree has, and get the volume ramped up. 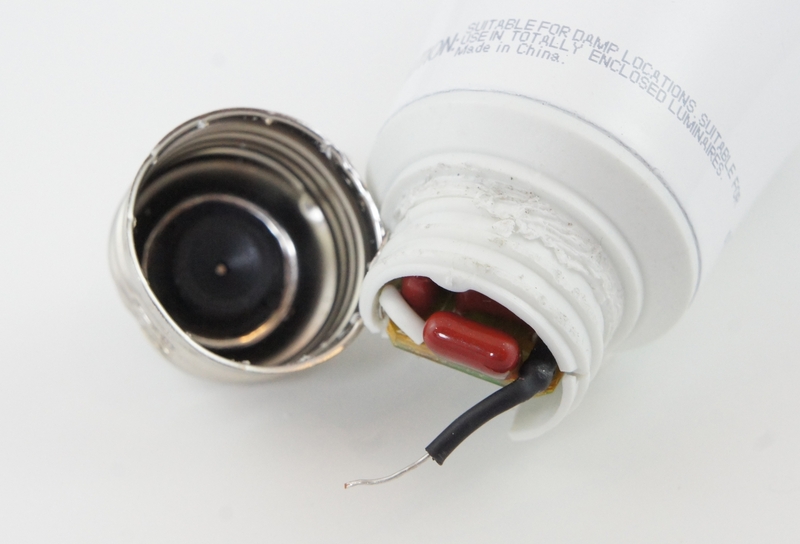 I did a teardown of my own on this bulb and found it interesting that the Philips bulb uses Nichia LED's. 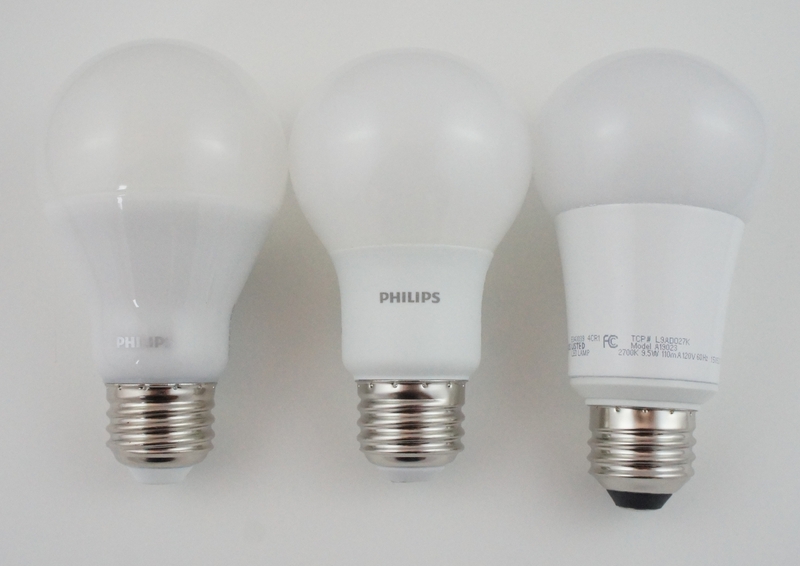 Another point to note about the cheap Philips bulb is that it does not meet Energy star requirements. A nice dissection. I've started seeing LED filament bulbs that look much nicer, e.g. 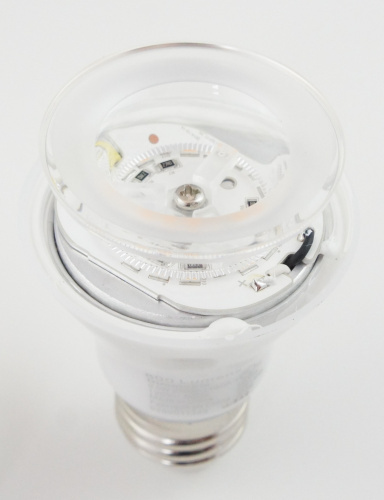 https://goo.gl/f1iNLW - nice-looking bulb, small (standard-size) socket, 360 degree light. I would love to see one of those compared to "normal" LEDs. Interesting . My only comment is that as an engineer, you should look up the definitions of transparent, translucent, and opaque. I doubt that the covers were opaque. I live near Seattle and my local power company has some kind of mandate to save energy. Several months ago they not only gave me enough Philips LED bulbs for my whole apartment but also sent out a team of dudes to install them all. I saw something similar but before the new LED bulbs came out. I got a free home energy assessment  and part of it was installing CFL bulbs everywhere in my house. The only problem I had was that they were listed as dimable, but my fancy dimmer buttons had trouble. I needed to keep at least one standard bulb on each switch to get the lights to turn on. it was required to get the tax rebate for a roof top PV instillation. Good point. Those are obviously diodes (and the labels sort of make it obvious). Thanks Nate! That was a very interesting dissection. The decisions of cost vs lifetime will probably lead to LED bulbs have much shorter lifespans. Hopefully they won't compromise everything and make them 3 year devices. Does this mean that we're unlikely to see SparkFun LED bulbs? Ready for some memory lane? We did, 7 years ago (May of 2008). This product and a handful of others (we sold four models) were called 'LED Lamps' at the time. $80 retail for a 60W equivalent. I thought they were the Future, but it was obviously a bad idea for SparkFun to carry them. Stick to building blocks, not consumer products. Unfortunately I can't link to the actual product (ID 8716). This was from an era when we actually delisted (made invisible) products. We don't do that anymore. I seem to remember hearing about the 2 pack of Philips bulbs being a new product and that they are only going to be priced that low for a short period to sort of entice customers to try them out. A Philips press release says the 2-pack $4.97 introductory price is for 90 days or while supplies last. A Philips spokesperson described the new offering as a âtransitionalâ product. Think of it, then, as a gateway drug, a chance to hook people on more efficient lighting and, eventually, the more expensive, more capable LEDs in the Philips arsenal. I thought about that too, but after some quick Googling, I'm pretty sure that 120V AC is the RMS voltage. Actual peak voltage is around 170V, yes? The wattage given is not a lie. The current given is not a lie either. But, the current times the voltage gives you the Apparent Power, while Watts is the Real portion of that power. They don't mention the reactive power and therefore the power factor (essentially how efficiently power is used). Check this out if it's unfamiliar to you Or Google "Power Triangle"
The Cree light bulb that I checked appears to be attempting power factor correction and achieves 0.97.